French macarons . . .
G. and I are enjoying a quiet, sunny day today. The kids are visiting in-laws and so we will have a quiet day and a simple supper tonight. Right now, I am listening to Dave Brubeck’s “Take Five” and feeling like snapping my fingers to the music–it’s so much fun to listen to it! Earlier, I went to the piano and played the 2nd movement of the C minor Fantasie by Mozart. The makeshift wooden board that G. placed over the pedal worked well with my leg that still has a heavy cast on it. Last night, with absolutely nothing to watch on TV (unless you wanted to tune into a four-and a half hour view of the “Ten Commandments”,) we decided to watch “Amadeus” the 1984 movie which won 8 Academy Awards. It’s a little grating to me with the Mozart character’s neighing all the time (from Tourette’s Syndrome)? But F. Murray Abraham (who won an Oscar for best actor in this best picture) plays Salieri, a rival court composer whose works are banal compared to Mozart’s and who is obsessed both by God’s gift of talent to Mozart and his equally strong belief that God has shortchanged him of same. This assignation of “blame” to God for Salieri’s shortcomings is one of the amusing conceits of the film. Reading about Salieri online, he is purported to have taught the likes of Beethoven, Schubert and Liszt so he must not have been as lightweight a musician as the movie, “Amadeus,” makes him out to be. Anyhow, seeing the period instruments (since G. specializes in all things piano) is a treat to watch. I was also reminded again hearing excerpts of Mozart’s great Mass in C minor with its rousing opening “Kyrie” how great a composition it is. So, I listened to it this a.m. before segue-ing to the more upbeat and laid back jazz of Dave Brubeck’s quartet and Paul Desmond playing saxophone. Did you know that it was actually Desmond who composed “Take Five?” I didn’t until recently when I watched Clint Eastwood’s masterful biographical DVD of Dave Brubeck which we saw on PBS a couple of years ago. For lunch today, I’m going to heat up some frozen Korean dumplings with chives and make a piquant dipping sauce of Chinese black vinegar, Japanese seasoned rice vinegar, Ohsawa soy sauce, sesame oil, chopped scallions and grated fresh ginger root. Afterwards, we’ll try a tiny sliver of the dark chocolate sour cream cake that I made yesterday afternoon. I had to bake it ten more minutes than the recipe called for and even then, the beautifully rounded middle sunk when cooled so it looked like a miniature tube cake! I also had difficulty broiling a miso eggplant dish for dinner last night–you couldn’t chew it and it felt and tasted like wet cardboard. I even tried frying it afterwards but to no avail. Then, I remembered the pizza stone the other night didn’t seem hot enough even though heated to 500 degrees. And that instead of the pizza taking 3-5 minutes to cook, it still wasn’t done at 15 minutes and I had to turn on the broiler to finish it. So, dear reader, it occurred to me that perhaps my stove/oven isn’t heating up properly. (DUH!) It’s about a dozen years old and I cook a lot, so it wouldn’t be surprising if it’s losing its legs, heat-wise that is. So, I dug out my oven thermometer and will be double-checking whether it preheats to 425 degrees when I get ready to roast the rack of lamb that we’re going to have for dinner tonight. I use Julia Child’s recipe for a mustard (Grey Poupon Country Dijon), olive oil, soy sauce, fresh rosemary chopped and lots of minced garlic–the marinade coating applied for the room-temperature lamb before going into the oven. The lamb on the rack looks miniscule so I’m hopeful that there will be something tasty there when it comes out of the dubious oven. 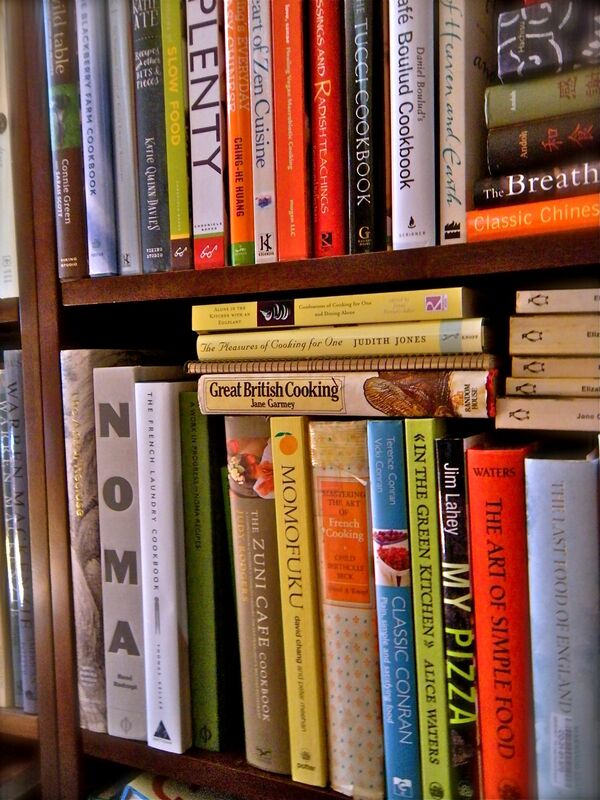 Yesterday, I don’t know what came over me–perhaps it was re-reading a cohort of British cookery books in the last few days–I decided to cull out and reorganize my bookshelves, one whole section of which is dedicated to food. One of the shelves now includes a set of Terence Conran, Roald Dahl, Jane Garmey and Time-Life volumes on making galantines, terrines, meat pies, trifles and aspic with eggs. In this group, I rediscovered the absolutely wonderful simple and yet appealing recipes in Nigel Slater’s cookery books. Slater’s recipe for roasting chicken wings suffused with fresh lemons and cracked pepper until the wings are caramelized to the baking sheet is one I’m going to try next week, I think. Even though they were somewhat pricey, I went through some books yesterday that had recipes I know I would never try (too conventional, complicated or took too much work/ingredients) so they went into the carton that will be donated to our local library. That is the only way I can justify ridding myself of books–which is to recycle them at an institution that will either catalog them or sell them in their bookstore. Back to the reorganization, the revised bookshelves also hold a section of what I call “Celebrity Chefs”: David Chang’s “Momofuku”, Rene Redzepi’s “Noma”,Thomas Keller’s”French Laundry”, Daniel Boulud, Stanley Tucci, Jane Grigson, Judy Rodgers’ Zuni Cafe Cookbook and the River Cottage series by that guy who has an un-spellable name. 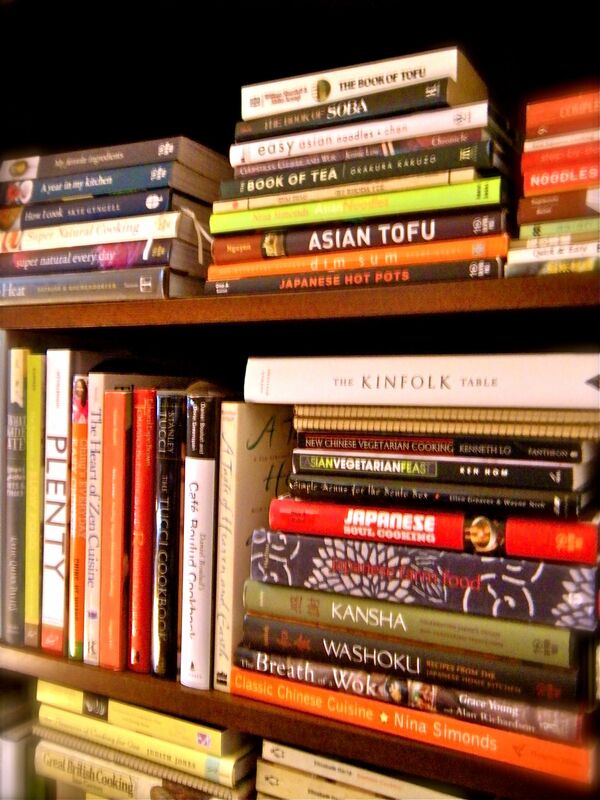 On the top shelf (for most usage) are short stacks of cookbooks featuring Asian noodles, tofu, dim sum, Chinese snacks, Bento box and Japanese Zen/Temple cookery. There’s also a smaller section down below on macrobiotic and raw vegetable ideas. 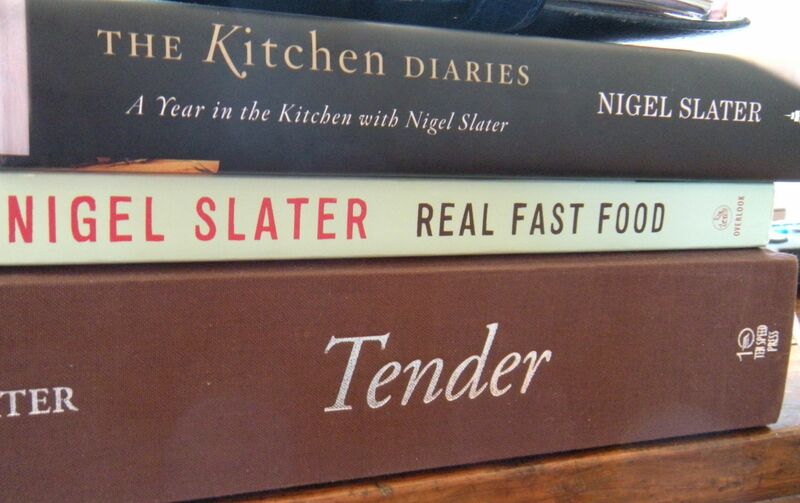 Right now, I think I’ll be cooking more recipes out of the Nigel Slater books than anything else. Not only are the books now better organized, there’s now room for more! 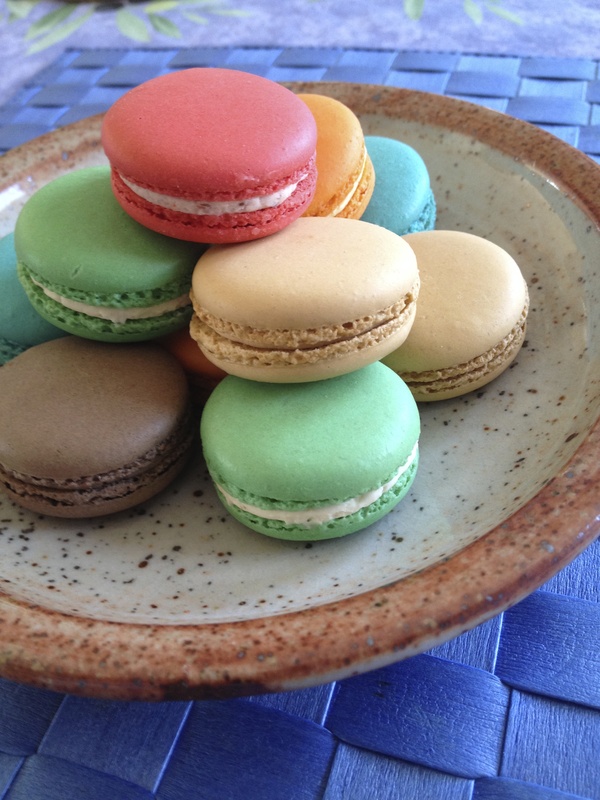 The photos above and below are of an order of French macarons that I made and had sent to C. and her husband for Easter. She teaches high-school French so these little treats seemed like the perfect thing for Easter. She’s going to share them with her in-laws after their luncheon today. The funny thing about them is that I ordered them from a baker on Etsy (one of my favorite places to find homemade things,) and in finalizing the purchase, I noticed a Chinese name in their email address. Sure enough, she was trained in France to bake these macaron specialties but like me, she’s Chinese. I meet many artists who are Asian on this site. 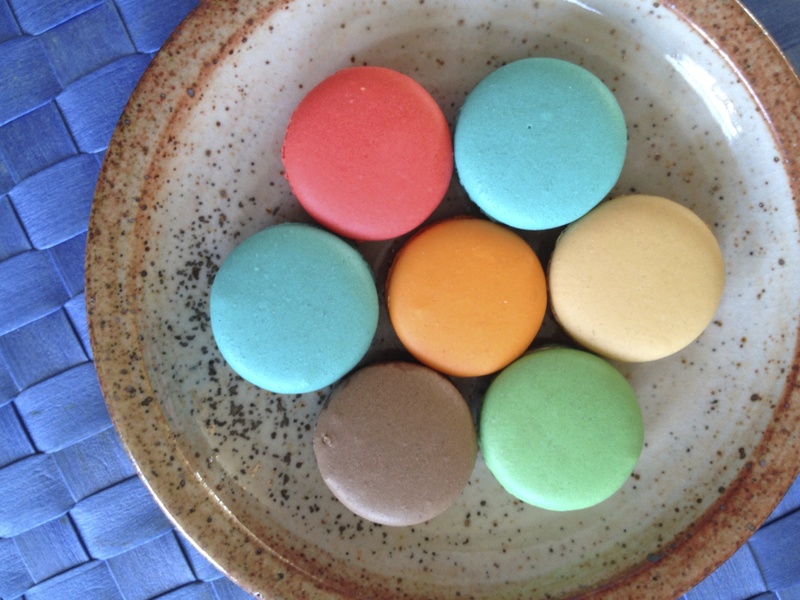 And in the oddest of places too–like with these macarons. They’re made of egg whites and an almond paste filling–somewhat like marzipan, I think. They arrived in time and C. said they shared one macaron before bringing them to the Easter luncheon and it was delicious! 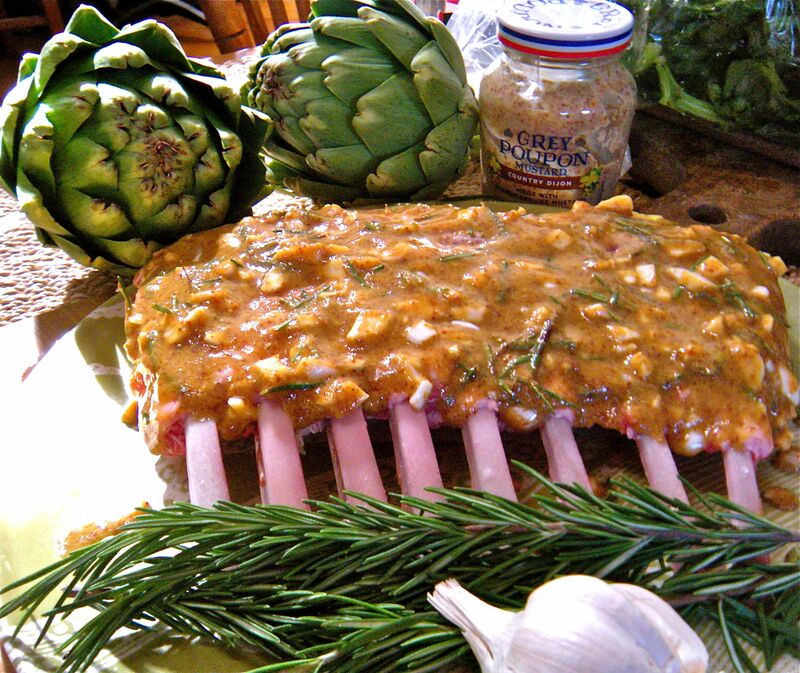 rack of lamb with mustard, rosemary, garlic glaze . . . In addition to the mustard/rosemary rack of lamb medium rare (hopefully,) we’re having artichokes with a curry mayonnaise as a starter, the lamb, small yukon potatoes crisped in butter and garlic salt, and parsnips (G.’s favorite vegetable.) And for dessert, the dark chocolate sour cream cake with chocolate frosting. So, here’s hoping you have also had an enjoyable day filled with reading the paper, Easter egg hunts and some nice wine and tasty food!